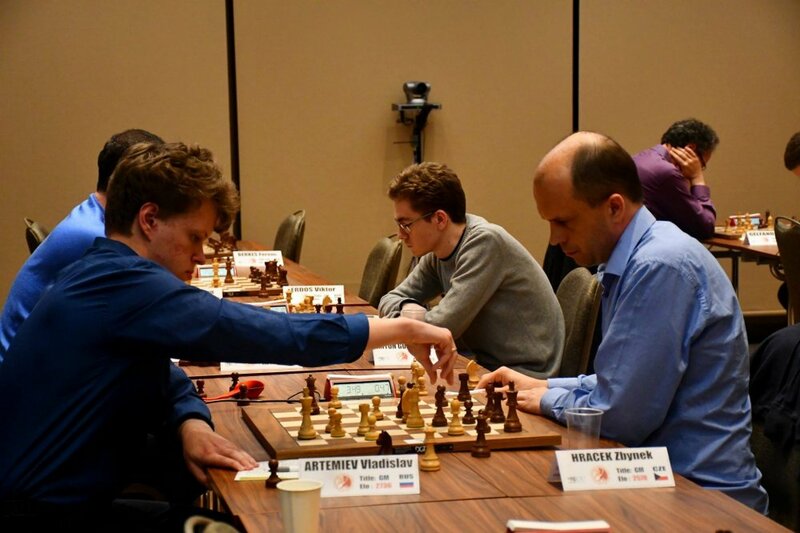 The quintet of players with 6½ out of seven rounds drew on Wednesday, allowing two more players from the 6-point group — Grigory Oparin and David Anton — to catch up and join the lead. Vladislav Artemiev, playing on board one, has celebrated one success after another in recent months: in December 2018 he became European Blitz Champion, in January 2019 he won the Gibraltar Masters, one of the strongest open tournaments in the world, and in March he played a pivotal role in Russia's gold medal at the World Team Championship. Now Artemiev, who also celebrated his 21st birthday on March 5th, has his eyes set on the title of European Champion. In the eighth round he underlined his ambitions with a nice attacking victory against Zbynek Hracek. With this victory, "the new Vlad" was in 13th place in the live world rating list, ahead of fellow Russians Sergey Karjakin and the recently retired Vladimir Kramnik. The other top pairings of the eighth round all ended in draws leaving five players with 6½ points at the top of the standings. The World Cup spots are going to be in the back of the minds of many of the players in Skopje, and we will see who's really trying to win the title versus prioritising qualification. This idea has been seen already in Skopje in earlier rounds (e.g. in Valsecchi vs Semjonovs, round five). White claims that ♘b3 is more useful than the alternative h3 preparing g4. In this game, however, Grandelius had no trouble equalising and mass-exchanges in the middlegame led to a 28-move draw, the first among the leading group to finish. Artemiev showed he's not trying to avoid a fight in the ninth round on the top board as Black against Kacper Piorun. Piorun met Artemiev's Sicilian with 3.♗b5+, but later transposed into an Open Sicilian Maroczy setup. After 12.♖ac1 Artemiev passed up playing ...♜xc4, although it was possible to do so. 13.♘b3 ♛a6 14.e5 looks a bit scary but Black has 14...♞e4 (14...dxe5 15.♘c5 is great for White) and the position remains level. Instead, after thinking it over for 16 minutes he castled 12...O-O and returned the knight to d7: 13.b3 ♞bd7 leaving White with a pleasant position. 19.♘d5 ♛xd2 20.♘xf6+ ♝xf6 21.♖cxd2 — but even with a slight plus, Piorun was unable to make serious headway in the face of Artemiev's defence and by the time control he was able to solve most of the problems, liquidating into a rook and knight ending with a pawn less but a holdable position. Here, 48.♔f4 allowed Artemiev to equalise with 48...♜d4+ forcing the king back 49.♔g3 ♞e4+ winning the g5 pawn because 50.♔g4 fails to ♞d6+, ♜xh4 and ♞f5+. Instead 48.♔g4 aims to meet 48...♜d4+ with 49.♔h5! winning. E.g. 49...♜d1 50.♞f4+ ♚f8 51.g6. Otherwise 48...♞d7 49.♖e8 is also very strong for White. In any case, the draw keeps both players in shared first place. There followed 10.hxg5 h4 (played after a further 7 minutes of consideration) 11.♖xh4 ♜xh4 12.gxh4 ♞f5 and here Rodshtein found a clever idea which is the best way to maximize White's advantage: 13.♔d2! ♞xh4 14.♕h1! The Israeli hung on to the extra pawn and manoeuvred patiently, eschewing a couple of entreaties to repeat moves. When he reached move 40, however, he seemed to hit a wall. Rodshtein's 41.♖d2 c4 42.♕d4 (42.♔a1 ♝xd5 43.exd5 ♞f4! 44.♕xf4 c3! results in a queen and pawn ending) ♞e7 allowed Korobov to win back his pawn and a draw was soon agreed. But 41.♕b3 was the way to keep the game going — the main point being that 41...♛xb3 42.axb3 ♜xb3 is good for White after 43.♘c7+ and 44.♘xe6. Despite the material equality, White's g-pawn is dangerous and his bishop is more useful than Black's knight.